Pixel density (PPF / PPM) is the best metric the industry has to define and project video quality. It allows simple communication of estimated quality across various resolutions (from VGA to 20MP+), AoVs (telephoto to panoramic) and FoV widths (from narrow entries to large outdoor areas). 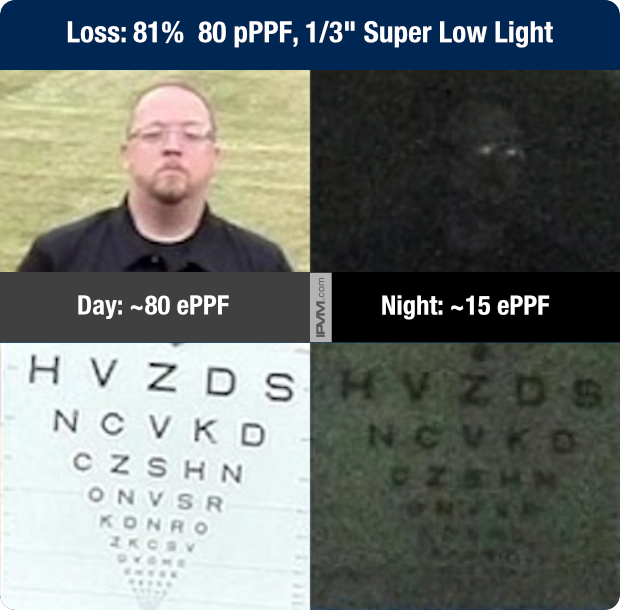 Low light / dark: Image quality tends to decrease as light diminishes so a 60ppf image in the day may deliver clear facial details in the day but not in the dark. Wide dynamic range: Image quality in WDR scenes is directly impacted by camera performance, as both strong backlight and dark areas of the scene can drastically reduce details. Wide Angle Lenses: Details at the edge of a camera's FOV are often frequently reduced due to distortion or reduced lens clarity compared to the center of the scene. What pixel density defines is the physical pixels per foot (PPF) or pixels per meter (PPM). Because of lighting and lensing issues, this is often more than the effective PPF or PPM delivered. 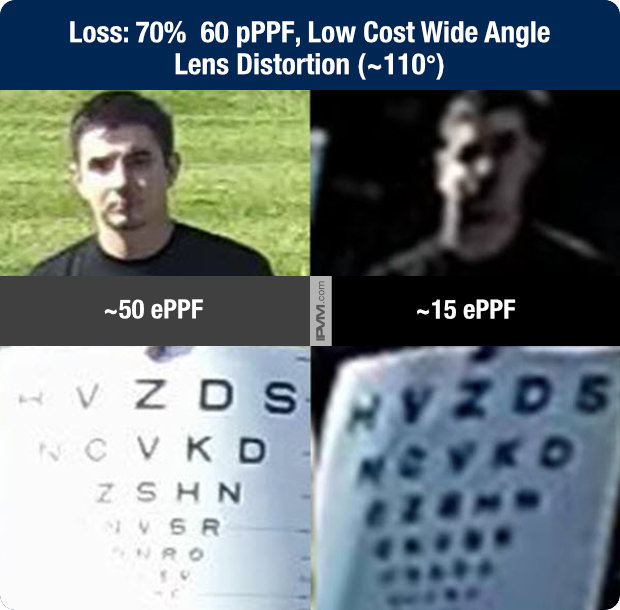 A loss occurs between the physical pixels per foot and the effective pixels per foot captured on video. 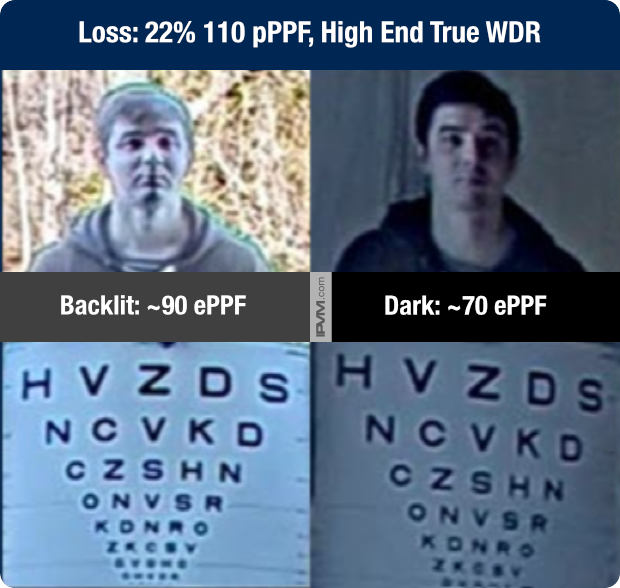 Determining the exact effective PPF is clearly subjective since people can reasonably disagree about 'effective' image quality. However, the fact that image quality is degraded, in effect, in practice, relative to the physical count is clear. For many users, low light scenes have the most frequent impact on ePPF. 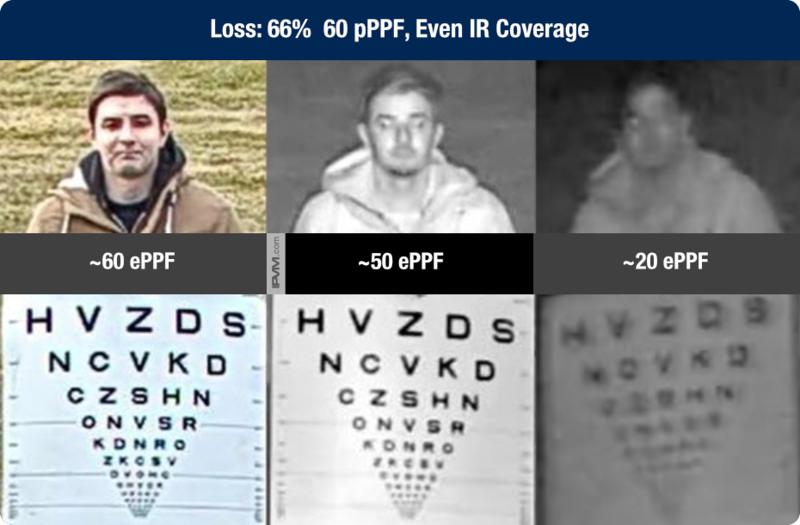 For example, looking at images from a common low cost integrated IR bullet, effective PPF drops to ~20 in a 50 pPPF scene, shown below, with identifying subject details significantly reduced. 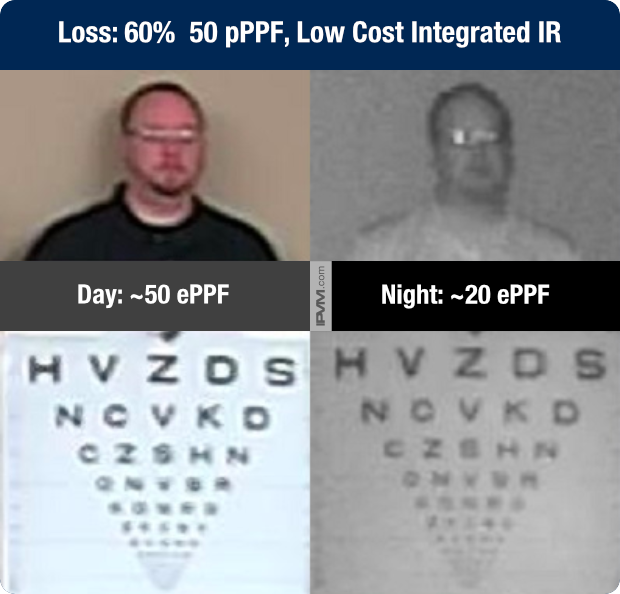 However, ePPF losses seen in integrated IR are generally better than those in super low light models. 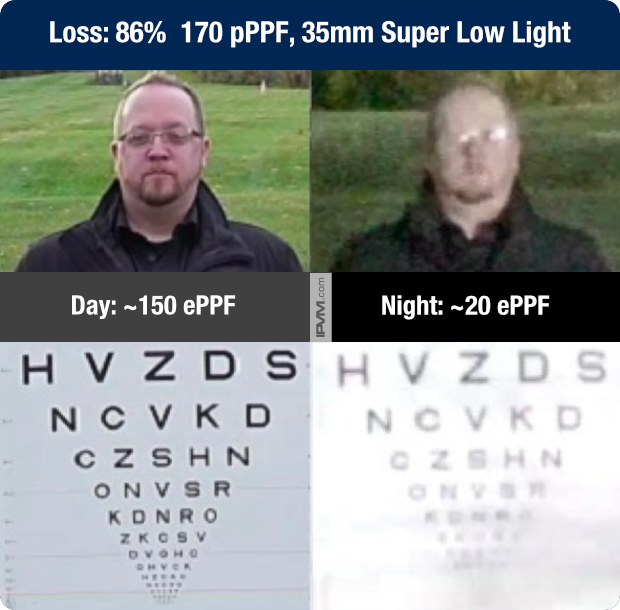 For example, the 1/3" super low light model shown below loses ~80% ePPF, effectively only ~15 PPF at night. Larger imager models fare moderately better, but performance is still reduced by ~66% in this 1/2" model, a high performing example. And, even in 35mm super large imager low light models, losses are great, with a drastic drop from ~150 ePPF to 20 in very low light (~0.08lx). 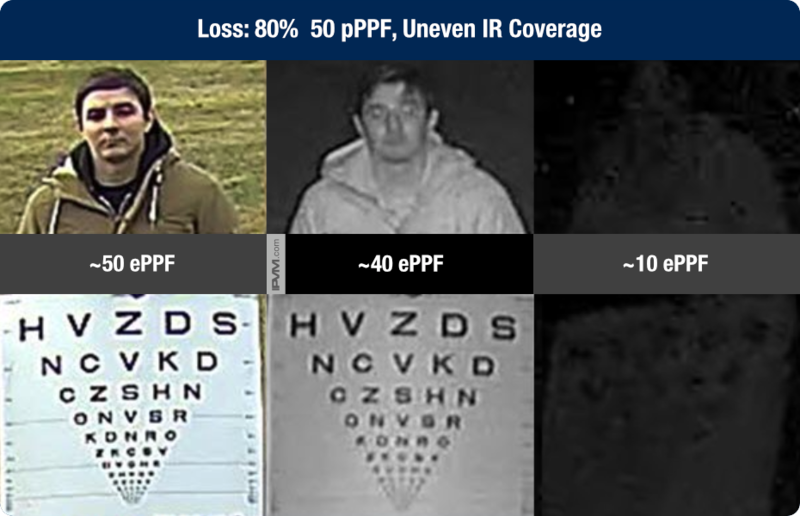 In addition to IR power, the evenness of illumination impacts ePPF, as well. 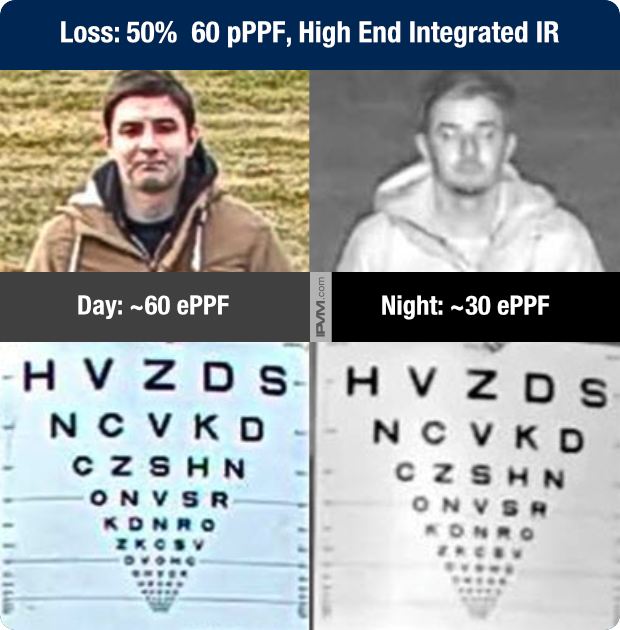 For example, while the center of the field of view is well illuminated, with a ~10 ePPF drop, dark edges caused by uneven IR coverage result in a huge drop, from ~50 ePPF during the day to only 10 at night. 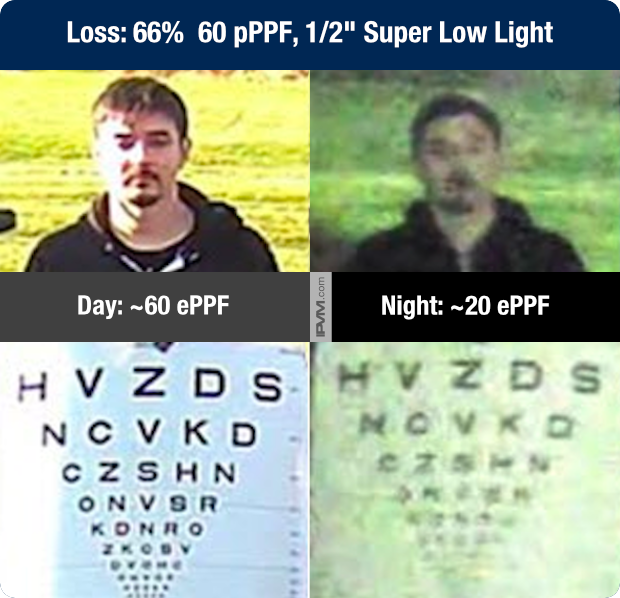 Even in cameras with "even" IR illumination, details are reduced significantly, with the camera below dropping to ~20 ePPF at night, a 66% reduction compared to daytime images. While low light issues may be most common, other lighting variances may have as much ore more of an effect. 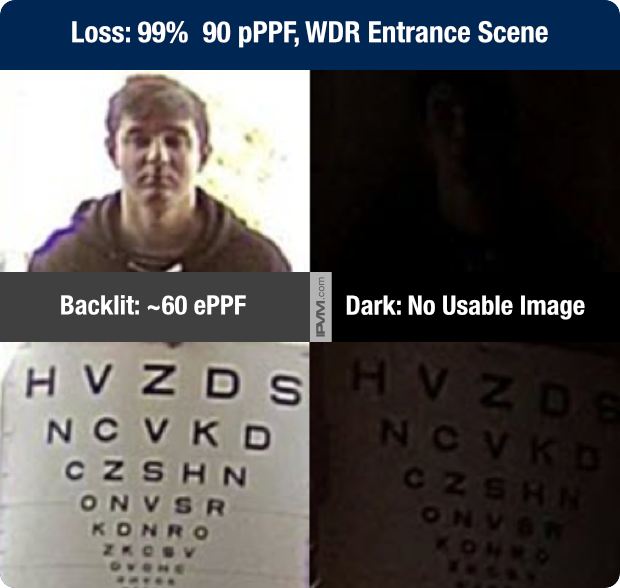 For example, ePPF in a camera with digital WDR only is reduced by ~30% against strong backlight, but produces no usable image at all in dark areas where the camera cannot compensate. Finally, even in well lit scenes, other factors may impact ePPF. Most notably, with wide angle lenses now increasingly common, lens distortion at the edges of the field of view. For example, in a high end model with a ~100° angle of view, ePPF is slightly reduced (~12%) at the edge of the field of view compared to the center. 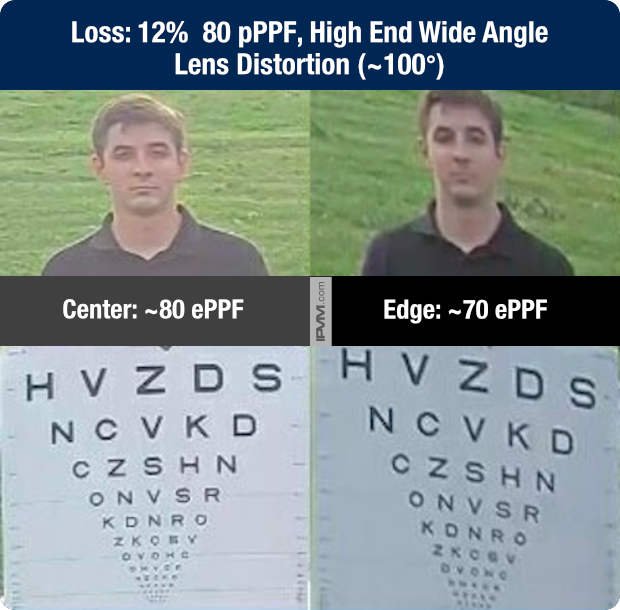 However, in a low cost model, ePPF drops drastically (~70%), from 50 to ~15 at the edge of the lens' view. Let us know below what questions, comments and feedback you have for this as we will incorporate this further into our courses and training.